Every year in January, we celebrate National Soup Month here in the U.S. 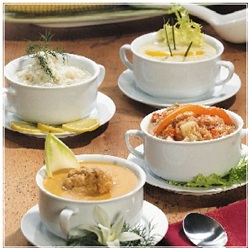 Though it is an American holiday, National Soup Month celebrates all types of soups from around the world. In recent years, other countries have started to get into the mix and celebrate their own National Soup Month in their unique way. As for ChefUniforms.com, we’ve decided to share some little known soup facts with our loyal readers. Bon Appétit! Americans eat over 10 BILLION bowls of soup every year! Women eat more than twice the amount of soup as men. Soup can be traced back to as early as 6,000 B.C. and used to be made out of hippopotamus! Soup used to be known as “sop”, and was a piece of bread served with a broth poured over it. As time progressed, the sop was poured into deeper bowls, and the liquid became the focus, rather than the bread. Sop became Soup, and the bread was then dipped into the liquid and eaten. Today, the word “sop” is used to soak something up. Each year, 99% of American homes purchase soup. Soup is a $5 Billion per year business. In the late 1700s, the King of France was so vain that he commanded his royal chefs to create a soup that would allow him to see his own reflection in it. Thus, consommé, or clear broth, was born. In the French court of Louis XI, the women’s meals were mostly soup, because they were afraid that chewing on solid food would give them facial wrinkles. Back in 17th Century Europe, thin soups were all the rage. This is because the soup spoon was invented so that the large, frilly ruffles that the men and women wore around their necks would not get dripped on. Before going on stage to perform, Frank Sinatra asked for chicken and rice soup in his dressing room. What’s your favorite type of soup? Leave a comment below with your favorites, or send us a recipe and we’ll post it! Enter your email address to follow our delicious recipes.